Update Jan. 28, 12:30 p.m. 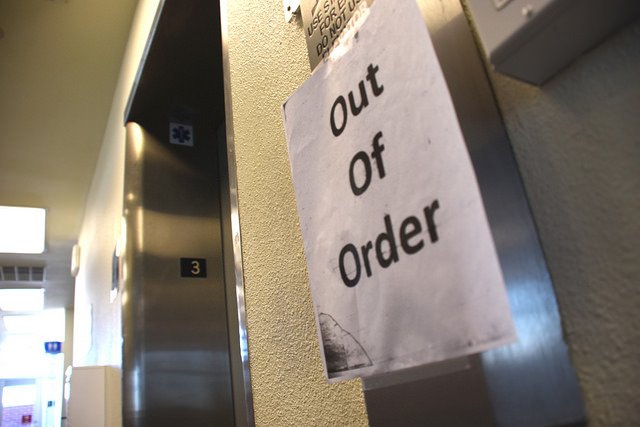 The American River campus library elevator was repaired and returned to service Wednesday. Nazanin Kazemi, a student worker at the library, said having the elevator not in use made moving books from the first to the second and third floor of the library very challenging. “I’m really happy that we can use the elevator because it really makes it easy for us,” Kazemi said. The American River College school library’s elevator has been closed since the beginning of the Spring semester with no clear date set for when it will be back in service. Tammy Montgomery, the Associate Vice President of Instruction and Learning Resources, mentioned that the job of the student workers is a lot harder without an operational elevator. “It has made a heavy workload for student workers who must move books up and down the stairs between the first, second, and third floors of the library”, said Montgomery. Montgomery also said that, during the library’s last renovation, they had the option to replace the elevator, which has been in operation since 1971, with a new one, but chose not to. When helping disabled students or other students with special needs, Montgomery said that student workers were being utilized to retrieve books and other learning materials for both staff and students that could not make their way up the stairs. Montgomery added that there wasn’t a concern about safety in emergency situations, but she hoped to have a working elevator soon. Student worker Raisa Sarioglo added that other challenges occur with the elevator out of commission. “The additional responsibility to carry the books up and down the stairs has made the educational process more difficult for everyone,” Sarioglo said. Daniel McKechnie, director of administration, said that ARC’s maintenance decisions are handled under an umbrella of the Los Rios School District’s Facility Management. McKechnie mentioned that the elevator was initially being repaired on Jan. 18 during the Martin Luther King holiday, but another problem related to the repair was noted as a “broken seal in a hydraulic pump” in the elevators lift mechanism. According to Mary Goodall, the secretary of Administrative Services, the elevator breaks down occasionally due to the aging ARC campus, and it, like the broken doors at Davies Hall and other maintenance problems, must be address as they occur due to the condition of the current maintenance budget. Be the first to comment on "Update: Broken elevator in the library repaired"